I got this Zoya polish as a surprise from Kellie over at Also Known As! Thank you so much Kellie! :) Julieanne came from Zoya's Wicked Fall collection from this season. This is my only polish from this collection so I'm super excited about it! Julieanne is a deep grape purple base with light purple glitter mixed in. What's interested about the glitter is at certain angles it reads almost gold, so even though this is a cooler color it does have a warm autumn feel if that makes any sense? I love this color. I don't have any sparkly purples like this. This is weird comparison, but do any of you in the US know that kids cold medicine Dimetapp? My mom used to give that to me when I was little, it was the only medicine I enjoyed taking. It was a deep purple and grape flavored. Well, lol this color reminds me of that medicine minus the glitter. I think of the strangest things huh? This is a beautiful color for fall! When some more money rolls around I hope to pick up some more of these from this collection! What are your favorite colors from the Zoya Wicked/Wonderful collection? I like the purple but my favorite is Carrie Ann! but Edyta is close second! I love the color & I totally remember Dimetapp! I love this one! There are so many gorgeous Zoyas. Too bad their exchange doesn't come around more frequently! 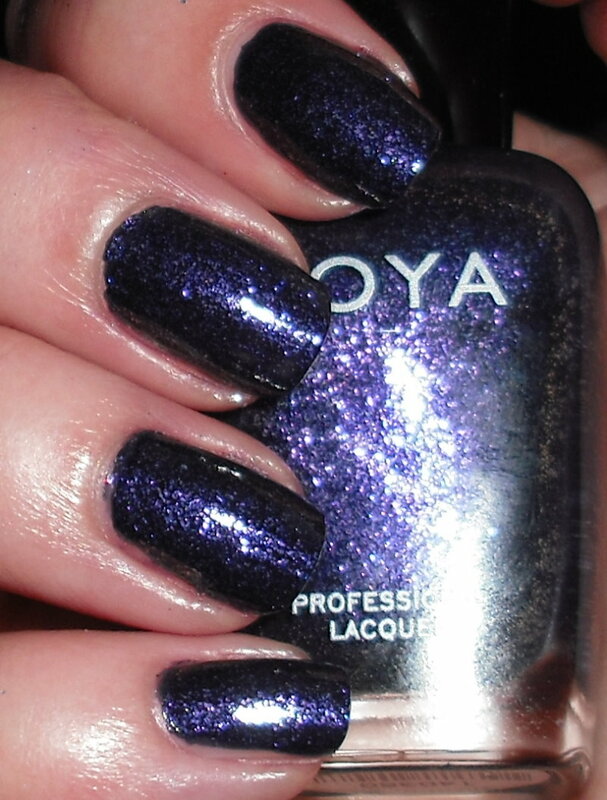 I'm still a Zoya virgin...lol! Now that's a purple! A deep, deep purple. Alas, I have no colors from this collection but she's so pretty! Yes I remember Dimetapp AND triamenic (sp?) haha. I love this! Stunning. Purple + glitter = Perfection! I must have this polish! This one is so on my list. This is a must have from this collection imo. I picked it up and I'd like to get Kelly and Edyta at some point. Wowza, I love this!! I don't usually like purples but this one is stellar! It reminds me of fall for sure. And Kellie is such a sweetheart :-) But we already knew that! Patricia- I really would like to get Edyta. amused- Oh cool! I didn't realize it is being compared to that! Jackie- Cheryl looks really nice too! Freshie- Haha, I remember triamenic too. I think Dimetapp tasted way better. Let them have Polish- Definitely. You can't go wrong! Aggie- Haha, I'm glad you all are familiar with my silly comparisons. Mocha- I'd love to get Edyta too. I'm not usually a green fan, but that one looks great! kelliegonzo- Thank you so much for this great polish. I love it! soooo pretty, i love zoya polishes and need to get more! Savina Coy - Fragrance Recommendations? Essence No More Drama + Giveaway Winner!